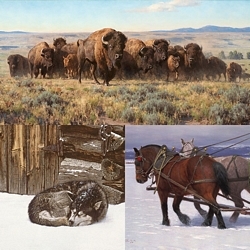 Image Size: 40"w x 16"h.
It is an often told tale, the demise of the buffalo in the great Plains. It was a combination of factors: the white man¹s misuse of the animal, using only a small portion and the irradiation of them to disrupt the Native American¹s way of life. They were dependent upon the buffalo for food and clothing, no part of the animal was wasted. Only the ones they needed were killed, the rest preserved for the future. Because of extensive conservation efforts, the buffalo, on the verge of extinction, was saved and they now roam parts of the west as they once did. “Painting is ninety percent work,” says Tucker Smith. “The rest is talent, but talent isn’t something you’re simply born with. Talent requires a great deal of perseverance.” Smith is well known for his painstaking approach to art. He does research, paints on location, and labors at his easel until he feels the work is exactly right. “I suppose I’m a perfectionist,” he says, and then adds with his customary modesty, “but it turns out all right in the end, I guess.” Smith was born in St. Paul, Minnesota. As he grew up there, he developed an interest in drawing, but he didn’t think it was possible to make a living as an artist. It wasn’t until he attended the University of Wyoming that he seriously started to consider a fine art career. Even so, he worked as a computer programmer and systems analyst for ten years before making the courageous decision to become a full-time artist. Today Tucker Smith’s art is part of the permanent collections of such respected galleries as the National Cowboy Hall of Fame in Oklahoma and the American West Art Museum in Wyoming. Smith is a member of the National Academy of Western Art and is the recipient of many major art awards, including the prestigious Prix de West. Smith lives with his wife, Jean, on a small ranch in Montana’s Rocky Mountains. There they have raised two sons and many quarter horses. The boys are grown now and out on their own, and there are only a few riding horses left in the stable, but the Smiths still live a picturesque life that is well suited to Tucker’s reputation as one of the country’s finest artists of the West.